Our Evolve Token Shaman deck guide for The Boomsday Project features an early, theorycrafting list for this potential upcoming archetype. Evolve Token Shaman was first created back in the Journey to Un’Goro, and it was one of the best meta decks at the time. 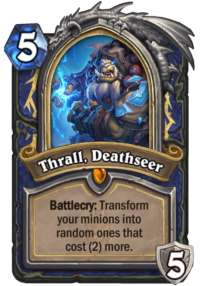 It cruised through the Knights of the Frozen Meta thanks to the Thrall, Deathseer Hero card (despite all of the unsuccessful Freeze synergies), only to stop around Kobolds & Catacombs, when it just couldn’t push through the meta. The deck has was basically nonexistent in Year of the Raven, but it might change with some of the tools Shaman is getting. We’ve already covered a faster, Aggro Shaman build, but this time I’m going to focus on something a bit different. While the deck is still rather aggressive, instead of going all-in on the opponent’s face, it features another win condition besides Bloodlust – Evolving your entire board. 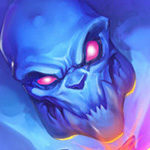 Both Thrall, Deathseer and The Storm Bringer can turn a full board of small, inconspicuous minions into a real threat. At this point, it’s hard to say whether you will want to build Token Shaman deck in a faster or a slower way, but it definitely looks promising going into Boomsday Project. Keep in mind that this deck is a theorycrafting. 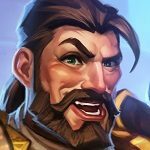 Most of the theorycrafting builds won’t become a part of the meta, and even those which succeed will likely be heavily changed. We don’t recommend spending Dust on the untested decks, especially if you’re playing on budget. Let’s start with one question – why a deck that didn’t work before would suddenly become so much better that it’s worth to play it? There are actually two main reasons for that. First is simply the amount of new ways to summon tokens. This build alone runs Voltaic Burst, Microtech Controller, Thunderhead and Giggling Inventor, but there are actually even more cards you can pick from (you just can’t fit more). And the second reason are new win conditions. 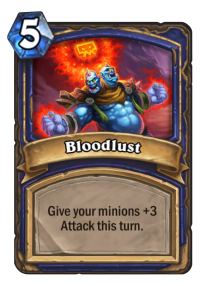 With the amount of Tokens, Bloodlust has became much more powerful option. If it’s easier to flood the board, then it’s also easier to burst your opponent down with it. We also got Electra Stormsurge, which can double Bloodlust on Turn 8. 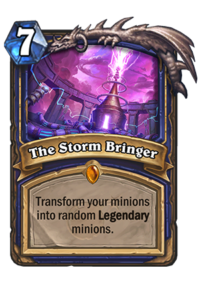 And the second new win condition is The Storm Bringer – a card rated rather poorly by most, but I believe in its potential. Talking about your win conditions, I think like people are generally underplaying The Storm Bringer. It’s not an instant win card, but it can turn a board full of small minions into potentially some serious threats. Even though we have lots of small Legendaries, an average one still has solid stats (I think it was over 4/5 on average), not to mention all of the extra effects you can get. Sometimes you will low-roll, but other times you will high-roll and immediately win the game. 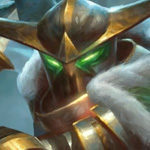 Even a single high-roll such as The Lich King with a bunch of mediocre stuff will already be well worth it. And it won’t even be that hard to play, thanks to the new Voltaic Burst. Let’s even say that only a single Totem sticks onto the board, going into Turn 8 you might play Voltaic Burst + Storm Bringer for 3 random Legendaries. While it’s nowhere near a guaranteed win, a good roll can buy you a chance in a game you might not be able to win otherwise. Thrall, Deathseer, while less powerful than Storm Bringer most of the time, can also swing the board nicely. Most of the small tokens you get on the board cost 1 mana, so while the upgrade will be significant (turning 1/1’s into random 3-drops isn’t bad), you won’t summon any big guys. But, there are some cards, which stand out when it comes to the mana cost. Main bodies of both Microtech Controller and Giggling Inventor, despite having 1-drop’s stats (2/1), cost 3 and 5 mana respectively, which means that Thrall would evolve them into a random 5-drop and 7-drop. That’s basically the biggest jump you can get, so you want to look out for the opportunities to do it. Saronite Chain Gang is also a good target – both bodies cost 4 mana, which means that you get two random 6-drops by evolving those. As for your other win condition, Bloodlust, it can’t be overstated how powerful the card can be with even a few minions on the board. 4 minions with 5 attack in total (a rather normal scenario) would deal 12 extra damage with a single Bloodlust, for 17 in total. That’s a lot of burst, so if your opponent can’t clear the board every single turn, he might be in trouble. Even a small opening can be enough to burst him down. But it gets even better if you get 2x Bloodlust, which now will be much easier thanks to Electra Stormsurge. Imagine the same scenario on Turn 8, when you drop Electra + Bloodlust – instead of 17 damage, you deal 29, which should be enough to kill most of your opponents (unless they’re playing Druid). Great thing about both win conditions (Bloodlust and Evolves) is that it will be incredibly hard for your opponent to stop them. They can be good even with just 3 minions on the board, and your opponent might not be able to clear every single small board you put down. Of course, Bloodlust or Evolves aren’t always necessary to win the game, there are other ways you can utilize your board floods. First and probably most importantly – Flametongue Totem. This is the card that makes all of the 1/1’s way more scary. While it’s not as powerful if you’re just going face (it simply adds 4 damage), it’s amazing card if you start trading. For example, a single Microtech Controller on the board is 4 damage in total if you want to do the trading. But if you play a Flametongue Totem, that damage goes up to 10. Add a single Hero Power totem and you can take down a Sleepy Dragon or something like that. Other than Flametongue, Knife Juggler does a great job when combined with board floods. Play him on the same turn you drop Microtech Controller, Giggling Inventor, or Thunderhead + Voltaic Burst and it can deal LOTS of extra damage. Then, you also have a Cult Master, which can be used to refill your hand when necessary. Even a simple play like Cult Master + Voltaic Burst can be really good, especially if you have something else on the board to trade off immediately. A card I particularly like in this deck is Giggling Inventor. I think it might be one of the strongest cards in the entire set. 2/1 + 2x Annoy-o-Tron is worth 5 mana combined, but combining cards like that usually add one or two extra mana to the cost. This one doesn’t. The card is like a post-nerf Call to Arms, but it’s Neutral, so every class can use it. While post-nerf Call to Arms is not as broken as the pre-nerf version, the card is still quite good in the right deck, and many classes would love to play it. If I had to make one bold statement about the expansion, I feel like Giggling Inventor might be nerfed to 6 mana after a while. But of course, I might also be completely wrong. The deck will obviously be weak to board clears, but not as much as you might think. The thing is, you reach this critical mass of ways to flood the board that your opponent might simply not have a way to answer it. That’s why despite Odd Paladin or Token Druid being weak to board clears, they can still win against slow decks quite often, because they might be able to flood the board more times than the opponent can clear it. It’s a similar story with this deck, in the mid/late game, you will put 3-4 minions on the board every turn. And the best thing is that your opponent can’t leave them most of the time, or else you might burst him down or Evolve them into something much better. To be honest, I had a really hard time making this deck. Not because the concept is difficult or anything, but because there are many more cards I would like to fit, but there are only 30 card slots. The first one is Corridor Creeper – with the amount of tokens you’re producing, the card can get down to 0 mana quite easily. It’s not as good as in Odd Paladin, but still solid. It also has extra synergy with Thrall, Deathseer – since it has a base cost of 7 mana, it will Evolve into a random 9-drop, and it’s very easy to squeeze him into your Thrall turn. But if you add Corridor Creeper, you’d probably want to add Unstable Evolution too, since those two have great synergy. I was also thinking about another 1-drop (such as Mecharoo or Argent Squire), another 2-drop (possibly Upgradeable Framebot, since it’s pretty sticky), maybe more Overload cards for Thunderhead (such as Zap!, Stormforged Axe or Feral Spirit). Maybe even Storm Chaser to pull your Bloodlusts and The Storm Bringer? But the question is – what can you remove to put them in? I thought about getting rid of Lightning Storm, for example, but without it the deck will have no defense against other board floods, so once it falls behind, it will stay behind most of the time, and that’s not great. Earthen Might might also be a flex slot, but I feel like the card can add some nice early game tempo, as well as mid/late game value to the deck. Or maybe Microtech Controller is not really worth it? (but then you would probably want to add another 3-drop anyway) The deck will need some extensive playtesting, but I feel like it has some potential. Since it’s just a theorycrafting and there are no statistics to back it up, I’ll just post some general guidelines for early playtesting rather than a full mulligan guide. You absolutely want to keep your early game plays. 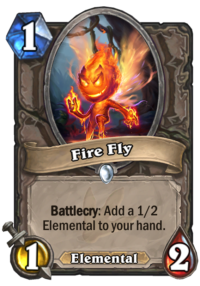 Keep Fire Fly, Knife Juggler, Primalfin Totem and Flametongue Totem. Microtech Controller is also a good keep if you have either Juggler or Flametongue. Keep Earthen Might with Fire Fly. Despite Voltaic Burst costing 1 mana, it’s not really a great keep most of the time. You pay 2 mana in total for 2x 1/1 with Rush, you usually don’t have anything you want to Rush into so early in the game (especially when going first). The card gets much better later in the game, when you can combo it with Juggler, Flametongue, Cult Master, Thunderhead, Bloodlust, Evolve cards etc. 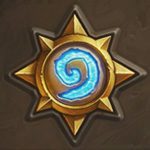 A Hearthstone player and writer from Poland, Stonekeep has been in a love-hate relationship with Hearthstone since Closed Beta. Over five years of playing and four years of writing about the game, he has achieved infinite Arena and multiple top 100 Legend climbs. He's the current admin of Hearthstone Top Decks. Check out Stonekeep on Twitter! Here is my take on the deck, which focuses more on elementals and early game tempo, thus relieving spaces from lightning storms(I haven’t had a problem with zoo(meaning, I handled them) from ranks 5-3), as well as one lava burst for emergencies. I highly want feedback, because I am very torn between juggler, wolf, nimbus, and primalfin, and whether or not 3 drops(looking at unbound ele, feral spirit, microtech) should be included, as well as the 4 drop slot(should I run cult master AND storm chaser?). I loved the various heydays of token shaman, and was excited to try this sorta deck out again as soon as they revealed Voltaic Burst and Thunderhead! Luckily, I unpacked The Storm Bringer, too, which is not a card I would’ve crafted otherwise. Already had Thrall, Deathseer and unpacked a Thunderhead, but was too cautious to craft Corridor Creeper or Electra (soon, probably). Won most of my games, losing to a mech Pally that slapped Missile Launcher onto that mech egg and Kangor’d everything, and a warrior that was COMICALLY teched against token so I couldn’t feel too bad about losing (Weapons Project, Blood Razor x2, Warpath x2, AND a mossy horror… whatyagonnado). Oh, and a zoolock that got away from me, but I won against Zoolock the next match. Zoolock has no comeback to this except for Dreadlord, which is easy to play around generally. And his cards hate hate hate knife juggler and being picked off by lightning bolt. Extremely early impressions on the deck: Saronite and Giggling Inventor are crazy good, here. Microtech controller is better than I expected, too (no good three drop otherwise, really wrecks shop if you had Knife Juggler the turn before. Baits out AoE quite well). Cult Leader works well as a draw engine, synergizing marvelously with the sparks. I was able to exploit Thunderhead once or twice- it’s great when you can do it! This might be one of those not-too-crazy cards that nevertheless works well because it just kinda gets value one way or another- if it baits a single target removal or silence, fine. You didn’t lose much and you just got a free turn to attack with your tokens. If they AoE and leave him alive, that’s fine too. You keep a body on the board and can punish the next turn with his effect. The spells to run are the toughest decision, here. Bloodlust and Voltaic Burst are obvious. At least one copy of Lightning Storm seems vital, in case you lose board control and need to clean up weakened minions (or just take out a Giggling Inventor after popping the shields). Earthen Might I’m not sold on. +2+2 didn’t help TOO much and the elemental you get tends to just clog your hand- this deck is incredibly tempo-based. I tried the new Elementary Reaction too. It was meh, but I got cards that didn’t help my topdeck. Hex is important, I think. There’s just too much stuff that can ruin your day without Hex, especially if Magnetize sticks around. (Crushing Hand might work well too, especially with giants and Lich King running around, but Hex is one mana “cheaper” and screws up deathrattle/revive). One spell I haven’t seen considered, but has potential IMO, is Spirit Echo. It’s anti-synergy with evolve, I know, but nobody expects it and you can nab a lot of strong battlecry cards back into your hand. Never got to use The Storm Bringer. I strongly suspect this is a win-more card, but might work better depending on the rest of the build. I had no Corridor Creepers to tempo with it, namely. I was lucky and get both Electra and The storm bringer, but I’m missing 2 Thunderheads. Is it worth crafting or replace it with corrior creepers? Thunderhead isn’t worth it, atleast in this deck. I removed it and made to rank 4 in 2 hours from rank 9. Incredibly strong deck, just add in Electra for confirmed bl draw. Boy you have no idea. Thunderhead is soo strong. Play another game when you think this card is not worth. I was lucky enough to open The Storm Bringer and Electra in my initial packs today, and I already had most of the other cards here, so I gave it a try. The only card I did not have was The Stormheads and I’m still not convinced they will be very good, so I replaced them with Corridor Creepers. I played a couple of games and won both. One against a token druid of sorts. He conceded after I played the DK. The second game was against Mech Paladin. Despite the fact that my opponent was playing huge minions that kept getting bigger, the amount of buffed tokens on the board made it impossible for him to build a presence and eventually I won. I was able to play The Stormbringer here on a full board and it generated a board full of huge minions. All in all, pretty cool deck thus far! 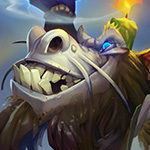 I loved playing token shaman/elemental shaman in the past because I love the DK thrall, so even before release I was theorycrafting some stuff. I kind of went the more elemental based route which also provides some nice tokens and lot of value but a bit weak on tempo. And I opened storm bringer which I wasn’t too big a fan before the release but I’ll play it. 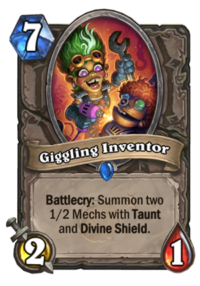 I also think that giggling inventor is such a powerful card in this deck. For ex turn 4 coin giggling into turn 5 trade with annoytrons and thrall for 2 pings and 2 3 drops and a 6 drops sounds insane. Also what do you think about the four mana elemental that draws a 5 or more cost spell that could be potentially good turn 9 for some bloodlust combo or draw the storm bringer when you are winning board. 3/5 is not even close to a “vanilla” 4 mana card. If you play an overload spell, you get a value similar than playing two cards. And I won’t discuss about how many times you’re going to make non-optimal plays just to get some value. So, adding more overload spells is a solution? This is a tokens deck, I’d doubt It. Basically, this is a rather slow and RNG dependant card in a fast deck. You can play it for full value in few games and it will give you some wins but that’s it. If you want to add Corridor Creeper, then cut one or two Thunderheads. I have to disagree. Yes, by itself is not a vanilla minion, but after one Overload card it already becomes a great 4 mana minion in a token-focused deck like that. You would absolutely play a 4 mana 3/5, which summons 2x 1/1 with Rush. Any more overload cards and it’s basically broken. So you basically just shouldn’t look at it like at a 4-drop. Violet Teacher also costs 4 mana, is bad on curve, and yet it’s played in Token Druid. 2 activations of Violet Teacher (which is I’d say the average outcome) is still worse than a single activation here (again, probably average outcome), because here the minions get Rush. I would argue that it’s almost a build-around card, it’s worth to make the rest of your deck a little less optimal just to activate it. It might be too slow in an Aggro version, but in a more Midrange version like this one, it’s like a godsend for Shaman. I like the deck, but I prefer the line up built by V1ci0us in his last stream on Twitch. He chose Arcane Dynamo in order to discover the second, the third or maybe the fourth (by Murmuring Elemental effect) The Storm Bringer. I wouldn’t say something wrong, but it’s 60% the possibility to discover the legendary spell. His line up is based on Elemental, this instead prefers the Evolve strategy. I mean, I like the V1c one, I think it’s solid, but this is viable too. Great work. Do you have his list anywhere? When rating Arcane Dynamo, I said that the card can be good in certain decks that always look for X specific cards. In this case, it might be good, because even if you don’t hit The Storm Bringer, you can also hit Bloodlust, which is another great card. But I dislike the fact that it’s soooo freakin’ slow. 6 mana 3/4 is a massive tempo loss. If it costed 5 mana or something, then I would seriously consider adding it into a few decks. But, we’ll start playtesting everything quite soon, we’ll see which cards work and which simply don’t! I agree with you, the body isn’t worthy enough. BUT, this is a deck minion based. Versus Aggro the board is contested, we have tools like Giggling Inventor and the Elemental package. Maybe when we have board control, we will be able to play Arcane Dynamo. Same argument versus Control, in some situation where we haven’t got much pressure. Let the meta cross out our doubts! When Evolve Shaman was powerful, I was quite new to the game and had a very small collection. DK Thrall was however the free DK I got, so it was quite sad that I couldn’t play Evolve Shaman back then. It’s a shame Evolve is not a Classic spell, it should be rotated back in as it’s now part of Shaman’s identity. Recently I have opened 2x Corridor Creeper and 1x Unstable Evolution, which were staples back in KnC. However I don’t see them in your list. I’ve also seen some hipster builds where you play Murmuring Elemental followed by DK Thrall for a massive upgrade of the board. Since I have DK Thrall, I will try the older build with the cards I now have, and also your build if I’m “lucky” enough to unpack the new legendaries from your list. 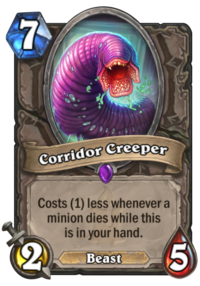 I talk about Corridor Creeper a bit in the last paragraph of the overview/strategy section, I think that it might fit well into a deck like that, it’s just a matter of testing which cards underperform and need to be cut. Right now it’s really hard to say, but I suspect that the final version would include the Creeper.